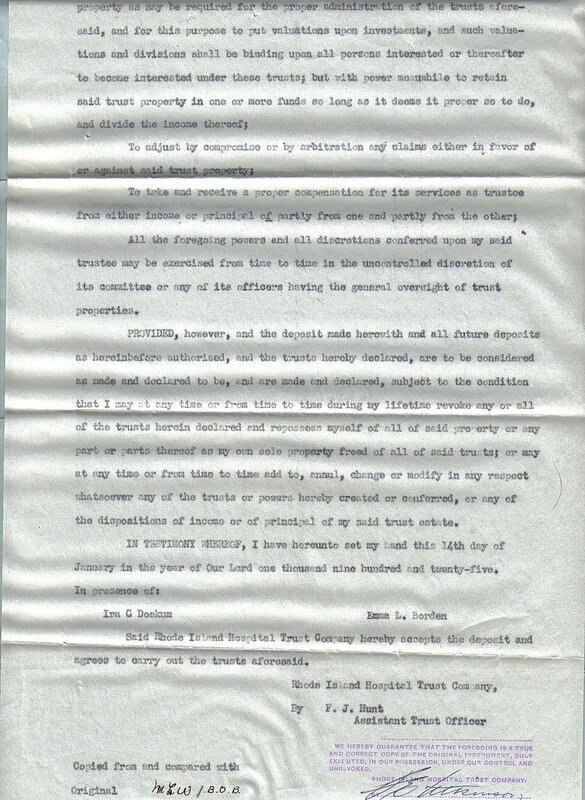 At age 69, on November 20, 1920, Emma Borden signed her Last Will & Testament. It would be greatly enhanced with a Codicil signed less than two years later, on June 27, 1922. Her Will and Codicil have been uploaded as a separate page to this blog. Click that selection at the top of this page to view them. 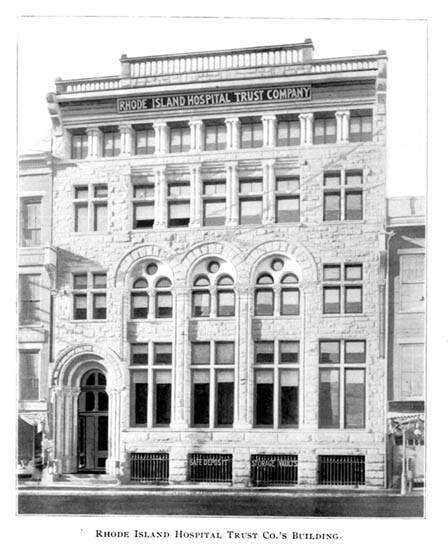 Subsequent to the Will and the Codicil, and something never written about before, is the fact that on January 14, 1925, Emma created an initial $45,000 investment Trust with the Rhode Island Hospital Trust Company that benefited – while she lived and beyond – an interesting assortment of selected individuals. B. Hamilton M. Gardner (nephew of Orrin who raised him as a young boy when his own father died). D. Annie C. Connor (the trained nurse and woman who would look after Emma in her last last few years of life in Newmarket, New Hampshire — and upon her death to her son, John M. Conlon). Note: Annie C. Connor died at the age of 75 on October 11, 1936 in neighboring Lee, New Hampshire. In addition, Emma allows for 5/45th to go to Mary Kelly (employed by Emma when she lived at The Minden Apartments in Providence, RI; and upon Mary’s death, the income to her son, John). Emma could not know she would be dead in 2-1/2 years, so why was this established at this time? Her Will & Codicil had already been written and witnessed a little more than five years previous to this Trust Fund. 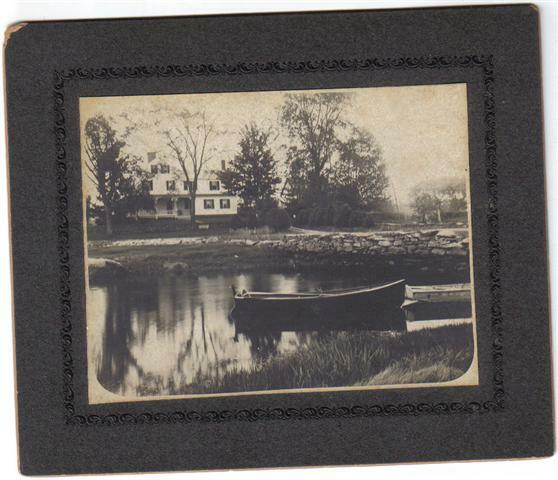 1924 Helen Leighton moves from Boston to Brookline, MA. February 24, 1924 1924 Woodrow Wilson dies. 1924 The Society for Human Rights in Chicago becomes the country’s earliest known gay rights organization. 1924 Machinery from the Borden controlled Fall River Iron Works to their mills in Kingsport, Tennessee marks the unofficial demise of the cotton industry in Fall River. 1924 Adolf Hitler publishes his Nazi political tract Mein Kampf (My Battle). 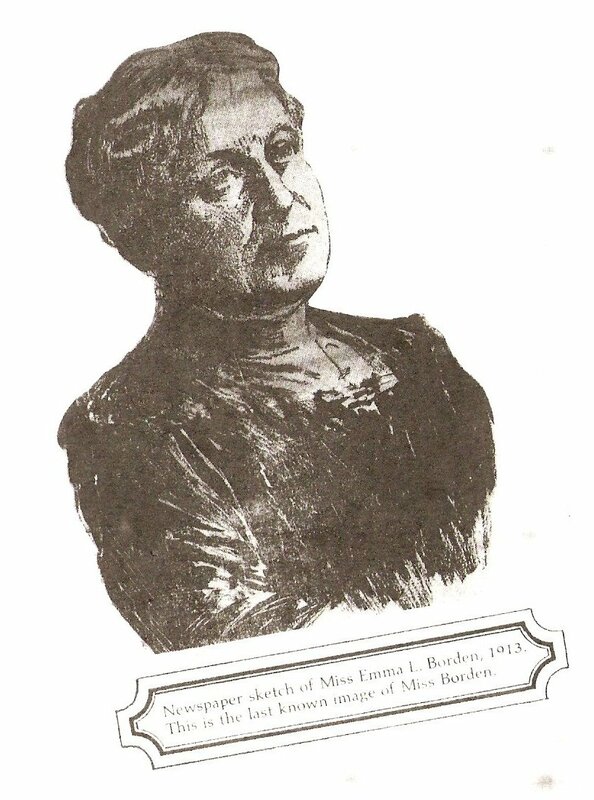 April 29, 1924 Hannah B. Reagan, former police matron, dies at the age of 73 in Fall River. 1924 Decline in Fall River textile mills begins; Fall River is no longer the “Cotton King”. 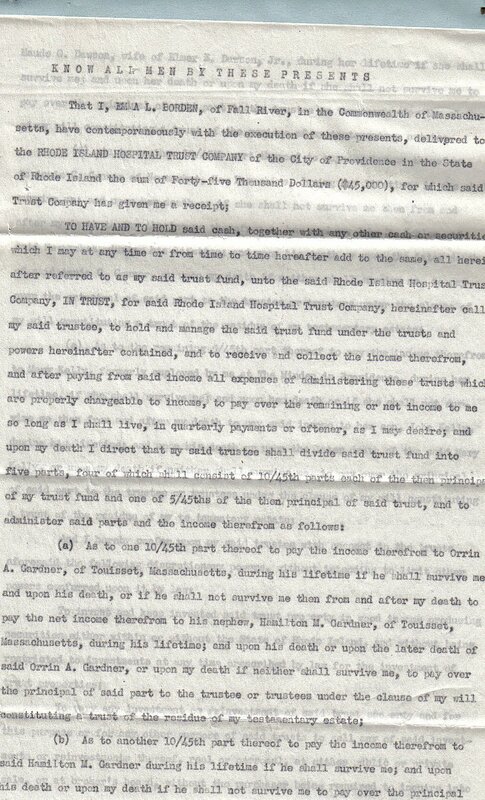 December 4, 1924 David Anthony, Jr. dies at Truesdale Hosp from injuries from a fall from his motorbike in Somerset on 11/24/24. The year before, 1923, Emma boarded for the summer in Newmarket with Annie Connor and then in 1924 lived there permanently. It was, in fact, through Preston Gardner that the Emma-Connor connection was made. So it would appear Preston Gardner saw to it that Emma had a nice place to live with someone who could care for her. The Trust Fund was undoubtedly administered by Preston Gardner, an officer and Vice President of the Rhode Island Hospital Trust Company that figures so prominently in Emma’s actual Will. Here is the actual Trust Fund document. Click on image for larger view. It strikes me that Emma may not have been very wise in the handling of her money in terms of investing it. Perhaps she just kept it in a bank not earning much interest. For the first 42 years of her life she never had to think about large purchases or any type of financial management involving significant sums. Maybe she never learned how. Her relationship with Charles Cook, who handled Andrew’s properties and subsequently “the girls”, does not seem to be as lasting as it was with Lizzie. It is possible that Emma was already showing signs of senility and her cousins, Preston and/or Orrin, prompted her to invest at least some of her net worth. In any event, this Trust ensured those named individuals of receiving income prior to her death and beyond. Do you Have any early info on Doris Gardner? Her sister was Beulah Joy, who’s daughter, Althea is Doris’s Niece (who is still living) who, remembers visiting her Aunt Doris, and Uncle Hamilton, at Riverby in the 1930s, and later through the years in fall river area. . Doris’s mother was Ruby E. Joy. 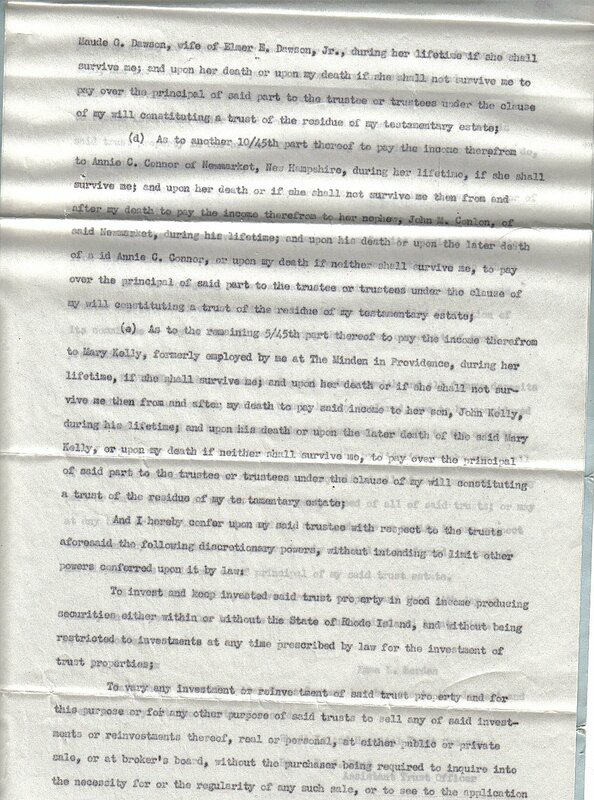 who was the half sister to my great Aunt Winnie Donnell. Do you know the year Doris was Adopted by the Gardners? She was in the Dover NH children’s home, as her mother did not have custody of her two girls, they lived at times with there father in Dover NH. Do you have any info on how the Gardner’s came across Doris? Hello. I only know what I have reported in my blog posts from my research on the Gardners at the Swansea Historical Society archives, housed in the Swansea Library. I don’t do research anymore. I suggest you follow up yourself as there IS much more on Doris. Or you can write them and hire someone local there to look up specific information. Hamilton’s son, however, is still alive and he provided me with much information on the phone several years ago. He is a very private man, however. Ed – meant to ask if you have read all the posts I have done here on the Gardners? You’ll find them in the archives – usually listed in “Swansea” category. Anyway, good luck in your pursuits. I found this newspaper article about an engagement announcement between Lizzie Borden and Orin Gardner. Can’t find any other information anywhere that says Lizzie was engaged at some point. Any ideas? Nice find. The New York paper picked it up from the Providence Journal as it appeared in Fall River (note byline). At the time it came out, Lizzie wrote to her dressmaker, Mrs. Wm. Cummings that it was a false and silly story. (You can view that letter via the Fall River Historical Society http://lizzieborden.org/lizzie-borden/lizzie-borden-collections/cummings-collection/) Orin Gardner was completely mortified by the publicity and more or less severed relations with Lizzie after that, altho he remained close to Emma Borden and was, indeed, the primary legatee in her Will. I’ve written extensively on this blog about the Gardneers. Oh, and btw, that letter appeared in one of the books about Lizzie and the murders tho I can’t recall which one right now. Thanks for sharing.